This is my third year at St. Cecilia as the art/resource teacher. I was born and raised in the Catholic schools of Omaha, attended Mercy High School and then went onto study art education at Northwest Missouri State University. I’ve had many wonderful opportunities working with a diverse range of students, teaching in many districts including Omaha Public Schools, Sioux Falls, SD, Millard Public Schools and the Catholic Schools as a classroom teacher. After fourteen years of teaching, I decided that I wanted to teach what I loved best...art. It was also important for me to return to the Catholic schools. I am so grateful to have found that opportunity here. Embrace Teacher of the Year and STAR 104.5 Teacher of the Week are a couple of recognitions that I have received. My husband Jay and I have two children: Millie and Liam who both attend St. Cecilia elementary, and we have two dogs Clark and Daisy. In my spare time, I enjoy learning about different cultures and religions, being outside, reading, visiting friends and family and trying new things. I am always open to visitors and guest teachers, so if you have an artistic talent and would like to share that with our students, please contact me. Art at St. Cecilia's focuses around three main ideas: connections, problem solving and perseverance. We weave art history, memorable artists and art movements into these ideas to offer a well-rounded art curriculum that centers around the elements of art and principles of design. After being a classroom teacher for so long, it is important to me to connect what students are learning in the classroom to what we are doing in art. So it's not uncommon to hear us using math, science, reading and social studies language in the art room. In the primary grades, art is all about exploration and experimenting. Students focus more on the process instead of the finished product. They test out and explore a variety of materials while figuring out how to get desired effects with certain tools. Learning that making mistakes is a good thing and not giving up are important parts of the artistic process. It's messy, and it's fun, and we love it! As students get older and move into the intermediate grades, we start to hone our artistic skills by looking more closely at how the elements of art work together to create something that is pleasing to the eye or a means of self-expression. Students learn about portraiture and proportions, specific artists, and artistic styles. At this age, students begin to learn about the purposes of art in our world and other cultures too. By the time students get to middle school, they have developed a certain artistic style, and our focuses shift to self-expression, art history and appreciation and the finished product. At this level, students create more sophisticated projects that take longer amounts of time. 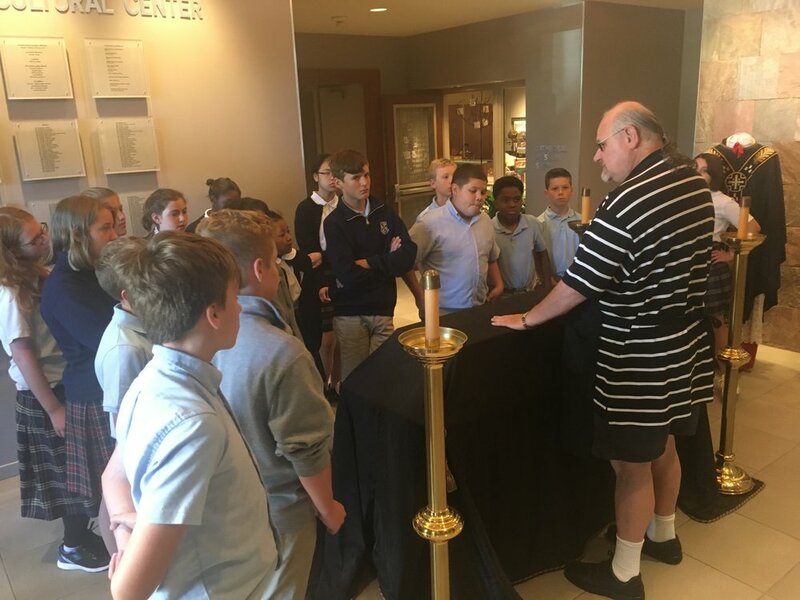 Middle school students also are invited to participate in city-wide contests and shows such as the Duchesne Spring Art Show and Jewish Community Center's Holocaust Art Exhibit. We are very fortunate to participate in many area art shows and contests such as the Colors of Christmas Contest put on by the Catholic Voice, the Henry Doorly Zoo art contest and Google's Design a Doodle. Senator Sara Howard also asks us to loan her student work to display in her office at the State Capitol. This is such an amazing honor, and we are excited to send her Nebraska-themed work this year. Speaking of Nebraska, to commemorate our 150th anniversary as a state, there will be a student art show in the Sunderland Gallery in January. It will coincide with our the annual flower show so be sure to swing by the Cultural Center to check it out. We wrap up our year with our annual art fair which is held in the school building. This year, the St. Cecilia Art Fair will be held on Monday evening after school where we will showcase our favorite projects from this year. I am always looking for ways to connect our students with artists in the community. If you or a family member are artistically inclined and would like to share your talents with a certain class, please contact me. I always welcome parents as guest teachers, artists in residence and volunteers.